Small Animal Talk: All you needed to know about dog science…from your toilet? All you needed to know about dog science…from your toilet? Those canine-minded readers out there need to know that this weekend, Friday-Sunday (June 20-22 - US Eastern time), you can catch a FREE, online, TED-style canine science conference (SPARCS). You don't need to be a vet or vet student, you just need to be interested in dogs. It’s live and free and you don’t even need so much as a login. As the organisers say, “you too can watch any bits of the dog science conference live and for free from your couch, bed, toilet or any other location of your choosing - we even know of several “watch parties” around the world”. I’m a sucker for a nerd-fest and the concept of a watch party. So what is SPARCS? Society for the Promotion of Applied Research in Canine Science — better known as #SPARCS2014 — is being held for a live audience in Newport, RI and broadcasting for free worldwide with TED-quality production. The conference shares current research in dog behavior, cognition, welfare and training with a general, inquisitive, and dog-loving audience. The line-up includes internationally respected and high profile dog researchers including Patricia McConnell, Simon Gadbois, Ray Coppinger, Sam Gosling, James Serpell and Clive Wynne among others. Each day has an incredibly doggie theme featuring 6 to 8 daily talks. Viewers around the world can pop in (and out) at any time. 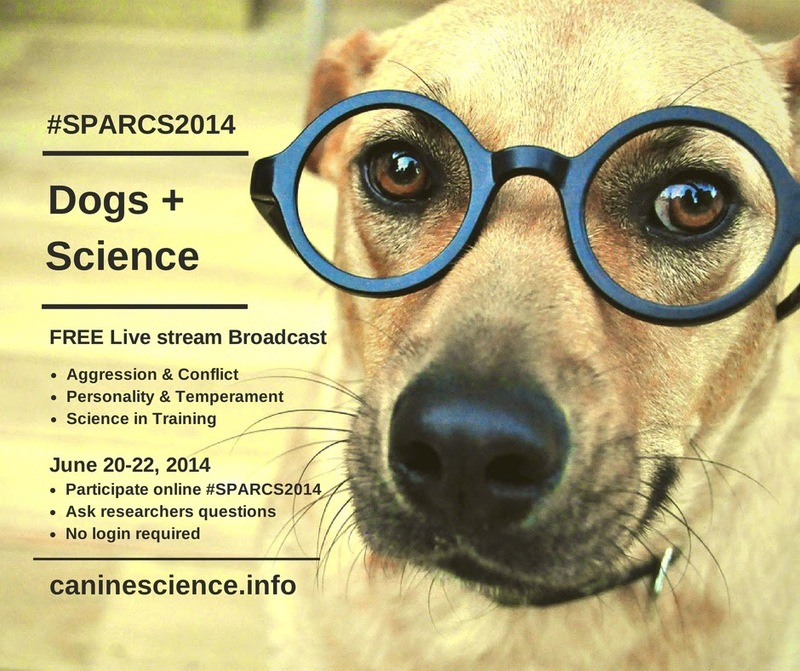 Last year’s SPARCS conference broadcast live to over 20,000 people around the world from over 50 countries. This year, SPARCS is expecting significantly more viewers. You can also follow the conference on the Do You Believe In Dog? Blog. They will be tweeting from @Doubelieveindog , and if people tune in online (particularly on Twitter with #SPARCS2014 ) anyone can directly participate. [And if you don't have a twitter account, do yourself a favour - its easy, its a brilliant source of news - often several days before the ordinary news covers it - and its not as labour intensive as other social media]. Canine scientists Julie Hecht and Mia Cobb will be answering online questions, interviewing each speaker — pulling questions from social media, and moderating daily end-of-the-day panels where viewers can directly engage researchers. Hungry for more? Read our interview with the exceptional Mia Cobb here or this interview with fantastic SPARCS founder, the inspirational Prescott Breeden (in which he reveals how SPARCS came about) here. AND if you are having a SPARCS watch party, send us your party pics!! !